Sometimes you just have to dodge a certain Facebook without feeling guilty to your friend by blocking or removing someone as a friend, which is not official not allowed on Facebook to bypass those annoyed thing but lucky you, if you are using Chrome browser, there is so called Blissfully a free chrome extension that works exactly like what we said above. If there’s any word or phrase that you want to omit in your Facebook News Feeds, then this extension will handle this. 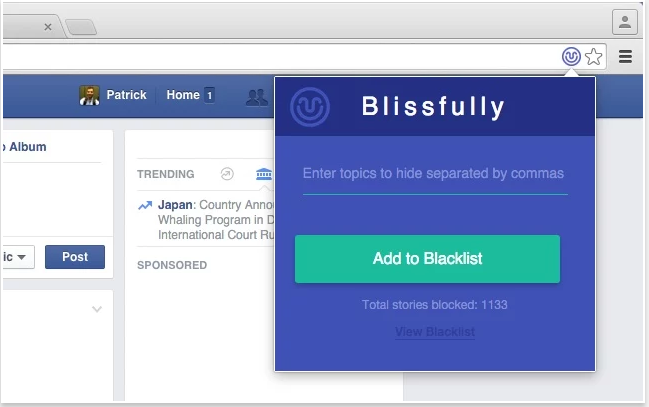 It let you choose a topics to omit from your News Feeds and those posts won’t show up at all its works like Blacklist, for instance if you’re tired of hearing politics opinions or maybe you followed someone that’s sharing adult content, Just simply type the word or the phrase and you are done. 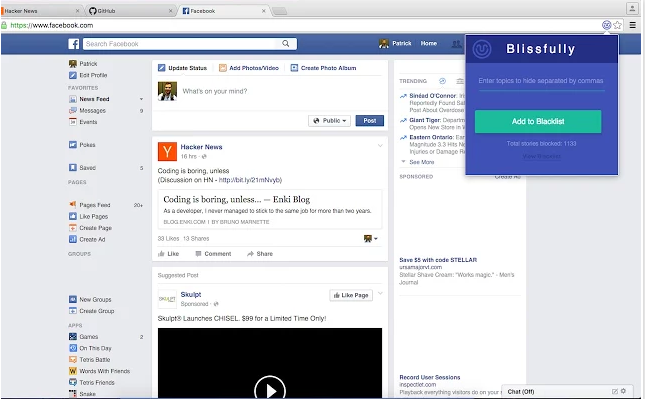 The extension only works while you are on Facebook and using Chrome Browser. When you install it click the Blissfully icon in your toolbar then just type word or phrases and make sure to break apart to encompass the entire topic you’re trying to block. For instance, If you don’t want see Donald Trump in your News Feed, it might be better off typing in “trump” instead of “Donald Trump” Often stories don’t necessarily don’t include first names so that topic might still appear. This rule is situational, though. Here you have it, toy around with your word and phrasing to achieve your desired filters and make sure to refresh the page for changes to take effect. If have another way that you are sure can handle this please use the comment below and state it and keep in mind that excessive page editing via Chrome extensions slow down the Facebook website. It could use up more memory on your computer. So use it wisely. With the introduction of Facebook videos, still many users don't know how they can download the Facebook videos that is being uploaded by a friend but they have no choice than just to watch it and live it online. in a case where you want to download your Facebook video and save it for offline watch, then this tutorial is for you to do so easily. A lot of people must have been wondering how they can easily download Facebook videos on their Smartphones or PC, but don’t know how to do that, now lets go straight to the point. You’ll see an option to download … chose and your download will begin. Scroll to any video you’ll like to watch offline, open it and the download option will automatically pop out. Click on the download button and your download will begin. So you are also part of the victims that want to clear out there Facebook inbox at once without deleting each conversation after the other, well this guide is certainly for you. Most at the times i want to delete all my outdated messages like that of 2009 and 2010 which are old enough to get rid of. Basically there is no any official way to delete all your facebook messages at once, but with the help of a little trick you can easily and simply do so. Some of the benefit of clearing out your facebook inbox to reduce your account spam messages and easily navigate through your recent messages. Some disadvantages of deleting your inbox messages is for reference purposes because it can be used against you or any party as part of evidence or reference when so required. Now i think its your time to turn your blog into something wonderful by exposing it in the world through the help of internet.org and facebook free basic program. Free Basic program is an Open source program by Facebook that will bring you free internet service in your locality without spending a dime. As you all know that Airtel is presently partnering with facebook in providing free internet service to nigerians and other african countries and its really a nice innovation but somehow controversial, because many are critising that the act of bringing free internet service will destroy net neutrality, well lets allow this argument for those that are expert on the field. My objective here is just to guide you on how to submit your site/blog to free facebook basic program so that users on the service can enjoy visiting your site/blog with there airtel line for free. 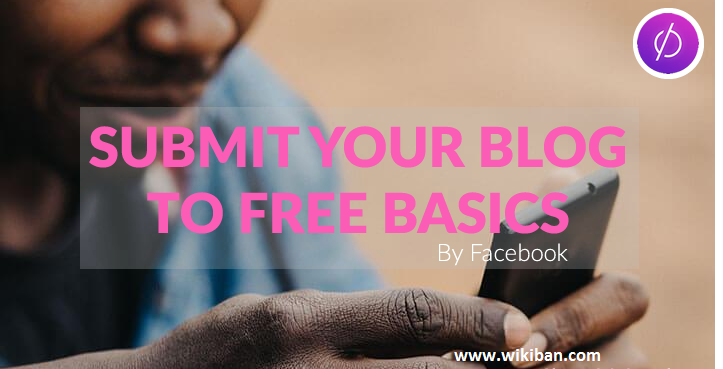 yeah thats what i mean you can submit your website/blog to free-basics facebook programs like the wikipedia, naij.com and other sites that is already on the list and this will allow users to browse through your site for free but its really not a simple job. Content Publisher can really enjoy the benefit of that service because its like a source of open traffic to your blog, imagine getting an audience of 1,000 to 100,000 within a month, you can't really predict how much audience you will get from Africa, Asia and Latin America that uses the facebook service for free. If you own a website or blog you can just join the free basic platform by adding your app, blog to free basic platform which in turns provide people free internet access to visit your site and other relevant online content beneficial to them. There are many benefit attached to this particular program if you add your site to this particular platform, it can help grow or increase your audience by providing affordable access to your services and improve your ranking position on the global net service, there is also a scale of social impact to your social media, as we know you can't underestimate the power of social media and its a really a choice to improve your marketing activities in a shortwhile by providing affordable service to your online marketing tools. Don't you think that the early the better for you to establish your brand mobile market and with over 100 million people visiting the internet daily with there mobile devices is a key opportunity for you to make your business visible to the world so that you can have a fastest-growing business environment. This is some of the services not supported on Free Basics video files, VoIP, file transfers, and high-resolution photos (which will be truncated if larger than 1 MB). You can help your service pass this stage of review by limiting your service’s bandwidth usage. After Submitting, Facebook will review your entry, and if approved, your content will be live on Free Basics for millions of people to access the world over. 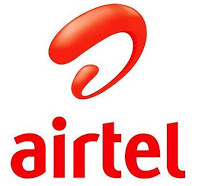 Airtel in partnership with facebook and internet.org now allows you to browse through facebook and chat for free. this is really a nice development because if you are a facebook addict like me here who cannot be able to go through a day without login in, then i think Airtel is the solution to your problem. If you don't have airtel line i advised you to grab one even for temporary use and for facebook purposes. You can actually login to your facebook without paying dime using internet.org affiliation partner with Airtel, If you don't forget the purpose of internet.org is to bring free browsing all over the world and now you can notice that by browsing through facebook for free using Airtel Nigeria. We hope and anticipate in the upcoming 3 to 4 years that we can start enjoying everything related to internet for free. 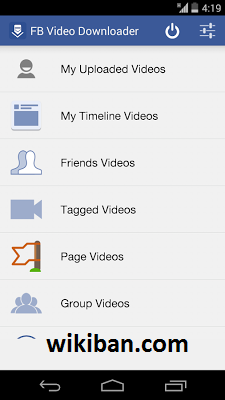 Well the only restriction on this free version of facebook is that the interface will not load and show you photos i.e. you cannot view photos or videos on the free edition of facebook by airtel but you can post, comment, like, share and/or chat with your friend on facebook and do so many amazing things you ought to have already doing. Yeah we must browse free, my objective is always to see nigerians browsing for free because we deserve so and we will struggle to look out for a cheap and affordable way for you to browse. Prelude to the recent data wipe by MTN hours ago another means of surfing the net freely with Psiphon Pro Lite Handler has emerged using the Airtel network which you can browse and download sharply. Its been a long time free browsing was not cracked using airtel but i guess now its there time to catch us up because there server is gonna have so much guest. i Have been flexing with this little trick a while and up to now its really working and if you wanna know how to configure it, just follow me patiently.